The print Wall Street Journal has great pen & ink drawings that many times do not make it to the razzle dazzle of the online world which seems to demand color photos, interactive graphs and on-demand videos. 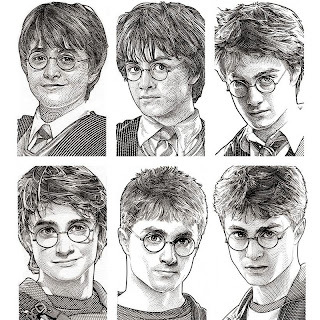 What I notice is that Harry goes from an almost cherubic round-faced tweener proudly wearing his school uniform to an almost gaunt, serious-looking young man whose uniform is T-shirt under an open button down. His glasses haven't changed, though. I wonder why he hasn't gotten on-board with the square-frame craze. Good for someone --- Rowling? the movies' wardrobe mistress? The last film in the series (Harry Potter and the Deathly Hallows, Part II) marks the end of an era. A customer just said, 'I thought the last film would be "Harry Potter Applies for Social Security".' The era that has ended is not children reading about Harry, but the wonderful excitement of anticipating the next book and then, anticipating the next movie. Now, the excitement is being generated by J.K. Rowling's next venture, totally online, with the sale of e-books, uploading of backstories and more.